Welcome to the official 1800Bride2b.com Bride To Be Wedding planning is a great place to find information regarding local Marriage Laws ,photographers, wedding vendors, wedding dresses, invitations, reception locations, bridal fashion designers, wedding gowns, honeymoons, jewelry, wedding bands, engagement rings, gifts and favors, disc jockeys, bands, limousines, budget saving ideas, hotels, tuxedos, insurance, real estate, bachelor & bachelorette parties ideas and so much more ! Special Offers from BrideToBe.com! 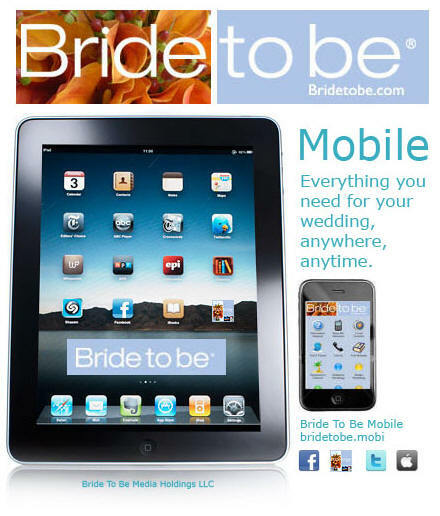 The Bride To Be Channel - bridetobe.com provides visitors professional resources for your wedding planning needs. BrideToBe.com offers to send exclusive discount opportunities, coupons, travel and fashion news and more from leading wedding businesses in your area that may be of interest to you. Please complete the following brief form in order to receive your FREE BrideToBe.com newsletter and detailed information from businesses in your area. I would like to receive additional information regarding the selected service categories. Regional Wedding Professionals - Select your regional State for local information. The Bride To Be Channel ® / Wedding Shopping Network™ broadcasts the following online publications. are registered United States Federal Trademarks.